No words to describe! Value for money for sure! Central location,very friendly staff,clean rooms,nice common place for chill out,nice and nutritional breakfast and very cool tarrace bar ! I recommend it! Have a nice stay in Seville! Hands down the best hostel I've stayed at (traveling for 7 months). Smiling, helpful staff, good breakfast, rooftop bar, incredibly solid wooden bunkbeds that have their own light, plug and shelf! Very quiet at night, despite being in a busy area. I also really appreciated that the other patrons were a variety of ages. It wasn't just a hostel for 22 year olds (though there were plenty of them). All kinds of people were there, which was an awesome feeling. I'd stay here again in a heart beat! The hostel had everything I needed - a clean private room, clean bathroom, great kitchen for my craft beer, a terrace. The location is amazing and there's a municipal car park in needed. It takes you 3 minutes to get on foot to the heart of Sevilla. The staff were extremely helpful, they know what they're talking about. Highly recommended and will go back! Breakfast is vegetarian - keep that in mind. It was a perfect beginning to Via de la Plata. One of the nicest hostels ive stayed in for a while. Everything is clean and new, and the design of the rooms is great. Comfortable and affordable. I really liked this hostel. The location is pretty central, within walking distance of the main sights. The room was a bit stuffy at night with 8 people in it and no open window due to the time of year but this didn't take too much from my stay. Seville is a wonderful city and I'll definitely be back some day. Really comfy bed, cool terrace and nice staff. Todo genial (el equipo del hostal, las instalaciones, la ubicación), excepto por las chinches en mi cama. Vuelvo a casa con picaduras por todos los brazos y el cuello. 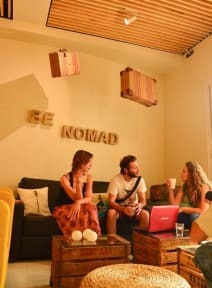 The Nomad Hostel is in a perfect location in the centre of Seville - easily accesible to all of the local shops, restaurants and bars. The hostel itself was very clean and had everything we needed. The breakfast which was included in the price was also a great addition. If the weather had been nicer I'm sure we would have made use of the rooftop bar!